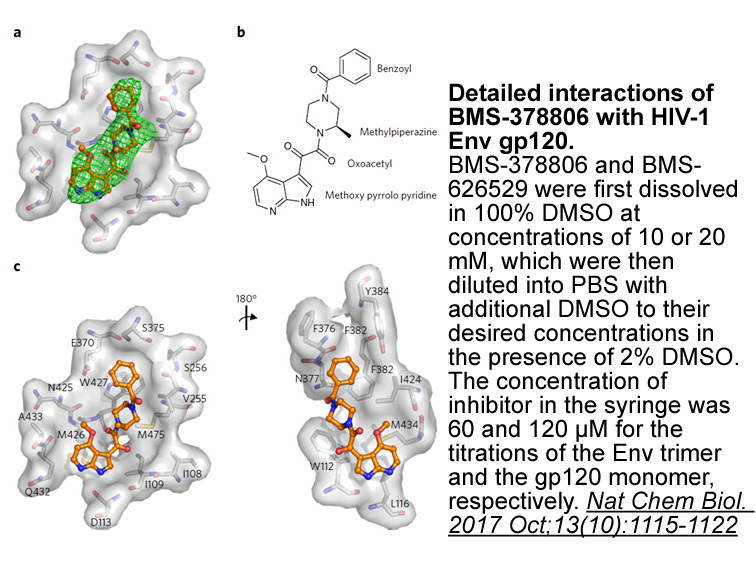 Description BMS-378806 is a selective inhibitor of HIV-1 CD4-gp120 interactions with an EC50 value of 0.85-26.5 nM. In general, host cells are infected with HIV-1 at a multiplicity of infection (MOI) of 0.005 50% tissue culture infective doses (TCID50)/cell followed by incubation in the presence of serially diluted inhibitors for 4 to 7 days. Virus yields are quantitated using an RT assay or a p24 enzyme-linked immunosorbent assay (ELISA) (NEN). The results from at least three experiments are used to calculate the 50% effective concentrations (EC50s). The EC50s of IDV, SQV, RTV, and NFV are compared to that of BMS-806 using Dunnett's test. These comparisons are made separately within each assay system. Dunnett's test is used to reduce the probability of false-positive results when a number of treatments are being compared to a control. Confidence bounds for the fold increases in EC50s observes when the same drug is tested in two different assay systems are computed using Fieller's theorem. The use of this theorem is necessary because ratios of parameters (in this case, EC50s) are known not to follow a standard probability distribution, such as the normal distribution. Numbers within the confidence interval are not significantly different from the observed fold increase at the 95% level. BMS-378806 showed HIV-1 inhibitory activity and cytotoxicity in MT-2 cells with EC50 value of 2.68 nM . Moreover, BMS-378806 inhibited the interaction between viral gp120 and cellular CD4 receptors and showed direct binding affinity to gp120 . Rats, monkeys and dogs model. BMS-378806 showed species-dependent oral bioavailability which was 19%–24% in rats and monkeys and 77% in dogs . 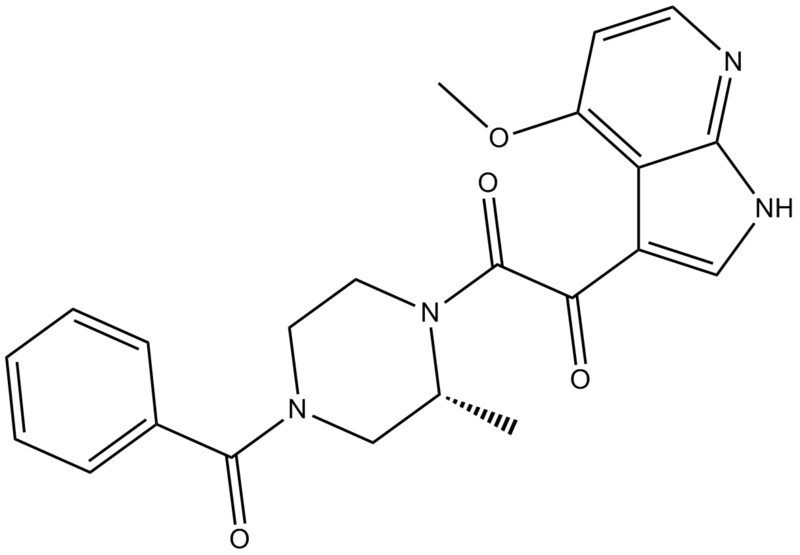 BMS-378806 is a novel attachment inhibitor of HIV with EC50 values of 2.68±1.64nM, 26.5±3.5nM, 2.94±2.01nM,15.5±6.8nM, 3.46±0.81nM, 1.47±0.63nM and 0.85±0.13nM for LAI(T), SF-2(T),NL4-3(T), Bal(M), SF-162(M), JRFL(M) and TLAV(dual), respectively . In a series of in vitro biochemical assay, BMS-378806 has been found to be not an effective inhibitor of HIV integrase, protease, or reverse transcriptase, but compete with soluble CD4 binding to a monomeric form of gp120 protein in an ELISA assay with an IC50 value of ~100nM. In addition, BMS-378806 has shown no overt cytotoxicity toward the host cell with a CC50 value of >225μM . Wang T1, Zhang Z, Wallace OB, Deshpande M, Fang H, Yang Z, Zadjura LM, Tweedie DL, Huang S, Zhao F, Ranadive S, Robinson BS, Gong YF, Ricarrdi K, Spicer TP, Deminie C, Rose R, Wang HG, Blair WS, Shi PY, Lin PF, Colonno RJ, Meanwell NA. Discovery of 4-benzoyl-1-[(4-methoxy-1H- pyrrolo[2,3-b]pyridin-3-yl)oxoacetyl]-2- (R)-methylpiperazine (BMS-378806): a novel HIV-1 attachment inhibitor that interferes with CD4-gp120 interactions. J Med Chem. 2003 Sep 25;46(20):4236-9.